A very quick entry for a title which may well be vapourware, but was briefly mentioned in the news pages of Zzap Italia back in 1987. After the massive success of The Sentinel, it would have been no surprise had a sequel have been in the planning or development stages. Mentioned in the same news item was Revs 2, which we believe would have been Revs+ that was released. Could it be possible that a The Sentinel+ or similar was planned by Geoff? We’d be massively surprised if anything was started, but you never know – maybe there were plans to expand the game and get a bit of extra life out of the title. Maybe Geoff some day could shed some light? 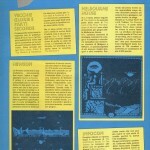 The Sentinel 2 was only an April Fool, a fake preview of Zzap! Italy. The graphics have been released by a friend of italian magazine. Was there another issue with preview screenshots in Ivan? This one was just a snippet, but it seems plausible, as there was a Revs+ – hence thinking there may have been a Sentinel + in the works too.